Do you guys think that the autocracy in Monaco should end? Definitely! The Monégasques deserve it. 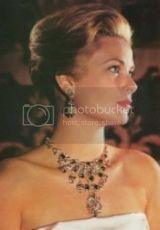 I love Princess Grace, but somehow her family (children) have become a bit of an embarrassment. There's no way I would courtsey to any of them. I used to think Caroline was the most responsible, but then I heard she stole her best friend's husband- Not cool. Anyways, to answer your question, if the people of Monaco don't mind supporting their Monarchy then they are welcome to keep it. One of Alberts advisors, Christine Stahl, left Alberts entourage today. The question is: by her one's own choice? I think Albert will improve now that he's married. I'd like to give him a chance, and Charlene seems like a very nice lady. Caroline has problems in the past with her marriages, but she has also suffered because of the bad choices she made. She and her husband haven't been seen together in public for a long time now (two years?) and he is with some girlfriend now. Her first marriage was when she was too young and against her parents' wishes and it also ended badly. And the man I believe she loved, Stefano Casiraghi, she had three children with him and then he got killed in an offshore powerboat racing accident. Stephanie was too much of a wild child, and now she looks old beyond her years. I don't think it will work since Albert has such a bad image adn the Grimaldis keep disgracing the country (however small), I don't see how on earth any of his decisions can be considered credible. An autocracy works only if the leader is highly self disciplined and can inspire automartic respect. I don't see Caroline really effectively running a country, mainly since she can't seem to get her life in order at all. Albert runs Monaco, but mainly well since there are no major problems for Monaco at the moment to really worry about. Caroline might be ambitious to be Princess of Monaco, but I don't think she (or Stephanie who would be next) understand just how much effort would go into running a country loaded with millionaires and shady types. She might hold the throne for Andrea, but could Andrea rise to the occasion and do well? There is no reason for one person to run things, especially if it relies on the judgement of someone who has not exactly run their own personal life responsibly. All it takes is one person to mess things up effectively and irrevocably. The Grimaldis are showing themselves unworthy of trust. I only say one thing if a royal family disappears, it is safest to other royal house disappear in Spain no longer want the monarchy and the luxurious life crisis occurring in Monaco is laziness, bad deciciones of Grimaldi House. In England and are quick to undo the Windsors. Monaco is famous for how to say "impouestos low." So I see no reason why Albert and his wife if they fail in their marriage that have tolerated. Too bad I think it would be great queen Charlene "princess." Make fun of her for wanting to upgrade to Monaco. But she is doing something for people to bring trade to generate stable employment Monaco, whether Starbucks, you start with something small to do something big.Rome was not built in a day and I think Charlene is well on paper princess. Thousand times better than waity Kate. I didn't say the Princely family should be disestablished, but they should not be running the country. Doubtful that Monaco would work without the Grimaldis. Sorry, KF. Didn't understand it.share the same point of view. They shoudn't run the country. Well, of course Monaco can work without them, but it's hard (for me, at least) image that situation. I just think that the Grimaldis are out of control and in some respects, the Windsors would have been thrown out for less than what the Grimaldis have pulled. Albert is not disciplined enough to successfully run a country and Caroline has been a good First Lady for a while, but I do not think that she would really be able to pull herself together well enough to end up actually run and represent well. The autocracy relies on one person making responsible decisions that benefit the nation, plus keeping your personal life clean to avoid complications and other problems. Let's pray Charlene brings good vibes to Monaco. Monaco exist because the Grimaldis do, take the monarchy out and Monaco will disappear. Apparently people like it there or they would leave. I personally like Charlene and want to give her a chance before I say they should kick out the Grimaldis. Maybe she will help Albert grow and change. Stranger things have happened. and I hope Leogirl is somewhat of a seer and that Charlene turns her guy into a good leader. Well, if they want to be shady about taxes, tax breaks, then they have to deal with the Grimaldis. It comes with the package. Or they could up and move somewhere else.